As we age, our bodies become more prone to natural deterioration and degenerative diseases. 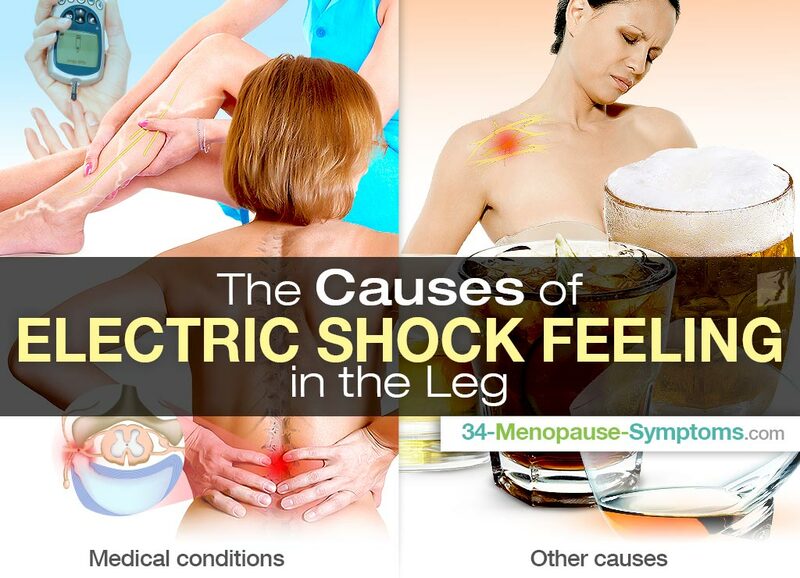 Some middle-aged women, for example, experience unpleasant electric shocks in the leg, which can be caused by a number of medical conditions. Keep on reading about the causes and solutions for an electric shock feeling in the leg to handle them with ease. Occurs when an intervertebral disc falls out of its place, causing a radiating pain with electric-like stabs and usually affecting one of the legs. It is a narrowing of the spaces between the vertebrae caused by a deterioration of cartilage. It compresses the nerve roots and spinal cord, resulting in pain and electric shocks in the legs when walking or standing. It is an inflammation of the arachnoid lining, which surrounds the brain and spinal cord. It causes chronic pain in the lower back and limbs with electric-like shocks in the legs. TTS occurs when the tibial nerve in the foot and produces a shooting pain in the foot, accompanied by tingling and electric shocks in the foot. It can lead to a serious complication, called diabetic peripheral neuropathy, if poorly managed. It leads to a nerve damage, causing pain, numbness, and sensations of electric shocks. Additionally, excessive consumption of alcohol can lead to a peripheral nerve damage, triggering electric shock sensation in the legs and other body parts. Women with alcohol problems often have vitamin B12 deficiency, which might worsen the symptom. Such as brachial plexus injury, can cause a shift or damage to vertebrae or nerves, causing symptoms, such as pain, electric-like throbs, and weakness, especially when walking and standing. Not all of the conditions, causing electric shocks in the legs, can be reversed, but all can be effectively managed to decrease this bothersome symptom. Such as non-steroidal anti-inflammatory drugs (NSAIDs) or anesthetic injections can reduce the pain and inflammation in acute cases, lowering the risk of electric shocks in the legs. It can effectively relieve the nerve pressure from the lower back and legs, strengthen the muscles and ligaments, and reduce electric shock sensations. Make sure your diet consists of sufficient supplies of calcium, vitamin B12, and phosphorus to promote bone growth. Try to cut down on sugars, too. Consider low-impact exercises, such as stretches, yoga, or swimming to strengthen lower back and abdominal muscles, as well as maintain a healthy weight. Quit smoking as it can lead to spinal disc degeneration and osteoporosis, putting you at risk for experiencing electric shocks in the legs. Try sleeping in a fetal position, on a side with the knees pulled up to the chest, to relieve nerve compression. Avoid soft and old mattresses. Custom orthotic shoes or shoe inserts, can help relieve the compression of the nerves, thus reduce the electric shocks. The most common risk factors for lower back problems, which result in electric shocks in the legs, are age, sedentary lifestyle, and obesity, all of which make middle-aged women more vulnerable to experiencing these symptoms. Keep a healthy diet and learn some exercise positions to protect your legs from electric shocks.